Wendy Slotboom has a new line of fabric out, it's called "Frolic" and I'm dying for it! Go check it out. It's so cute. There are 9 different fabrics in 3 colorways- pink, blue and green... OMG. Chippies (you might THINK they're squirrels, but I want them to be chipmunks and so that's what I'm calling 'em!, there's a reason for this!) 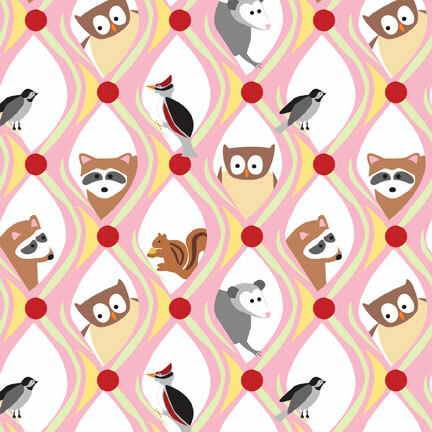 possums, raccoons, pileated woodpeckers, owls, birds, there are even yard-art flamingos in the treasure map, this fabric is sooooo me! I'm leaning towards the pink colorway, but may have to mix it up! My only wish is that it was less pastel and a little brighter, bolder, but I'll make do! LOVE IT!!!!!! It is so darn cute. So cute! I have some of her 'feathered friends' range which I love. I love those racoons! Think I may need to invest in some too :) It's a pity I have champagne ideas on a beer income! LOL! Good idea about the clock by the way! That cracked me up. Because it's so light out until 9ish we shut up all the curtains so Ollie thinks it's dark out. He had the worst night ever last night. Go figure! Oh. My. God. If you tell my Chookie I WILL KNOW!!! Okay? Keep schtoom, puh-lease!! And those are definitely chippies, they have stripes! Indeed, they ARE chipmunks, but unfortunately they have squirrel tails,uh oh! And not even a cropped off one. I gasped when I opened up your blog and saw this cute fabric then I laughed out loud when I checked the fabric site. My mother in law had a lovely pond she had made in her yard that the racoons frequented much to her chagrin. My father in law would trap the racoons - but they were live traps and even though he would take them miles away to release them we were all pretty sure they made their way back. 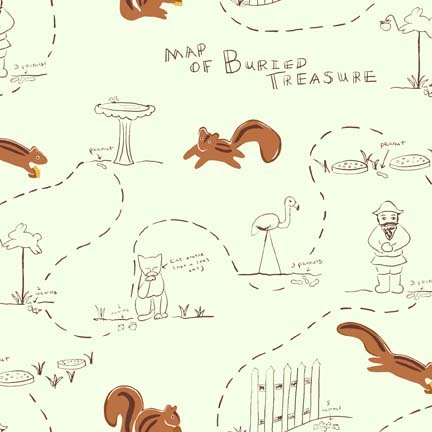 I love that squirrel/chipmunk fabric!! I can't wait to make something from it for my daughter. I only purchased a few bolts from this line, and once I saw it in person I really wished I had bought more! !